Transparency International Malaysia president Tan Sri Ramon Navaratnam said the issue of corruption had been deeply rooted in this country, as it had become a part of the living and habit of Malaysians. Ramon said during an exclusive interview with Sin Chew Daily that corrupt officials were living comfortable lives and were thus unwilling to make changes. Although Prime Minister Datuk Seri Abdullah Ahmad Badawi has reiterated that the country wants to be more open, democratic, liberal and to fight corruption, he said this idea must be put into implementation. Ramon said where the prevention and battling of corruption to ensure transparency in governance is concerned, Malaysians generally still lack the awareness. “The public know where the problems are, but choose to remain silent. They must seriously look into this issue, listen and express their views, if they really care about the country. “If the government fails to rectify the problem of corruption, then don’t show them your support in the elections. Ramon said the general elections last March were a turning point for the country’s political situation and future, but we have yet to see whether the country will continue moving on the right track after this turn. He admitted that the country had become more open-minded, the media more liberal, policies more open and government more positive to combat corruption after the March general elections. However, conflicts have also surfaced within Barisan Nasional because of this. He said although most people felt that Abdullah had not done enough to check corruption, some thought he had done too much and too fast. “Such a drastic effort has affected certain quarters of people, and therefore these people try to slow things down a bit, even to drag down those who actively battle corruption. When asked to compare the incorruption, transparency and corruption-fighting effort of BN and Pakatan governments, Ramon said BN had many years of experience ruling the country while Pakatan was formed less than a year ago, and it is therefore unfair to make a comparison between the two. Nevertheless he said the policies implemented by the state governments of Penang and Selangor so far, such as open tenders for public projects, have received positive responses from the public, showing that Pakatan is still open-minded and clean so far. Ramon said Prime Minister Datuk Seri Abdullah Ahmad Badawi had laid a solid foundation for his successor, Deputy Prime Minister Datuk Seri Najib Tun Razak, adding that Najib should be able to fight corruption more effectively and speedily upon this foundation. He said Najib should ensure that Abdullah’s reform agendas and new rules would be put into effective implementation in a transparent manner, or the integrity of the country and its government would be jeopardised and the public would lose their faith in them. 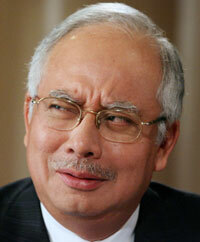 “Compared to Abdullah, Najib should be able to do it better. Abdullah inherited a tough problem from former prime minister Tun Dr Mahathir, but the foundation has now been laid and Najib should therefore act more boldly.